The Conference is a key milestone in the international campaign to curb the impact of cancers, cardiovascular diseases, diabetes and chronic lung diseases. It is jointly organized by the Russian Federation and WHO and aims to support Member States in developing and strengthening policies and programmes on healthy lifestyles and NCD prevention. 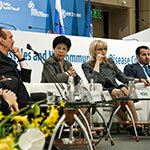 The First Global Ministerial Conference on Healthy Lifestyles and Noncommunicable Disease Control took place in Moscow, Russian Federation on 28–29 April 2011. European delegations met before the Conference to discuss WHO European Region’s challenges in and solutions to the problem. This is the final version of the report from the United Nations Department of Economic and Social Affairs (UNDESA)/WHO Regional High-level Consultation, incorporating feedback from Member States. 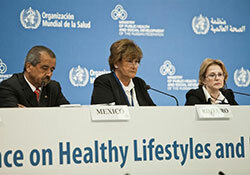 It was presented at the First Global Ministerial Conference on Healthy Lifestyles and Noncommunicable Disease Control, held in Moscow, Russian Federation on 28–29 April 2011.